Initial conservative management of radial nerve entrapment includes rest and modification of activities. Activity modification includes educating the patient on limiting repetitive forced supinatory activities, repetitive pronation activities, repetitive forceful gripping, or resisted end range elbow extension activities. To help control the inflammation that may be contributing to the syndrome, the use of anti-inflammatory medications may be prescribed. The use of a static forearm based functional position splint may be used to rest the extensor muscles of the wrist and fingers. The splint may also include the elbow to limit elbow extension and forearm pronation/supination. In cases with more significant weakness, extension assist outrigger component may be added to aid in passive finger extension for improved hand function. For cases that worsen or fail to resolve with conservative care after 3-6 months, surgical decompression may be indicated to prevent further nerve damage. Recovery and outcome will depend on the extent of the nerve damage with the vast majority of neuropraxic problems resolving. Treatment of a patient after they have had a decompression includes a gradual return to activities over a 6 week period. The primary diagnosis that may cause difficulty with differential diagnosis is lateral epicondylitis. In early stages, both diagnoses may present with similar presentations with dorsal forearm pain and pain with resisted wrist extension. The patient who presents with posterior interosseus syndrome may have subtle finger extension and thumb extension weakness. The use of a lidocaine injection may aid in the diagnosis of lateral epicondylitis as it should significantly decrease pain in this diagnosis for a temporary period of time. Compression or injury of the radial nerve may occur along its course on the posterior side of the humerus in the radial groove from humeral shaft fractures or as it winds to the anterior side of the lateral epicondyle from epicondylar fractures. It may also become compressed from the fibrous bands of the radiocapitellar joint. In cases with high radial nerve injury, only the triceps would be spared so there would be a complete absence of the wrist, finger, and thumb extensors. 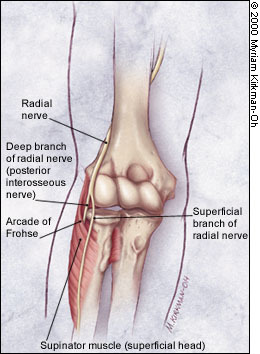 The superficial branch of the radial nerve may become entrapped as it runs under the tendon of the brachioradialis. This diagnosis is known as Wartenberg's disease and is sensory only. Interventions for treating the posterior interosseus nerve syndrome: a systematic review of observational studies. Ultrasonographic evaluation of the iatrogenic peripheral nerve injuries in upper extremity. Median and radial nerve compression about the elbow. A unified approach to radial tunnel syndrome and lateral tendinosis. ↑ Robson AJ, See MS, Ellis H. Applied anatomy of the superficial branch of the radial nerve. Clin Anat. Jan 2008;21(1):38-45. ↑ Thomsen NO, Dahlin LB. Injury to the radial nerve caused by fracture of the humeral shaft: timing and neurobiological aspects related to treatment and diagnosis. Scand J Plast Reconstr Surg Hand Surg. 2007;41(4):153-7.